My name is Anthony Higgins, but most people call me Racetrack. I am a Newsie. All day long I sell and deliver papers. 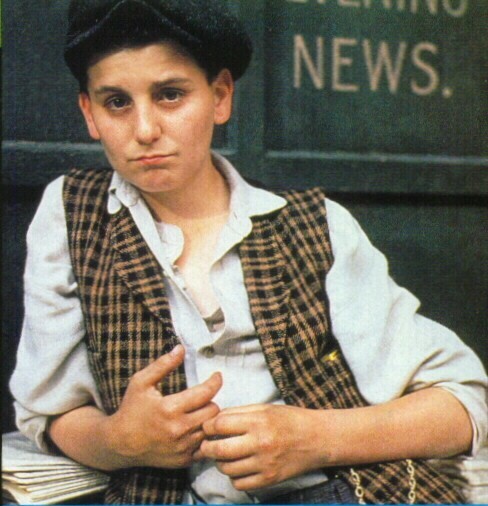 I became a Newsie when i was about seven. I don't really mind being a Newsie because it helps me get out of school sometimes. In fact, most of the time I'll just sneak out of school and sell papers. All of my friends started calling me "Racetrack Higgins" because I'm always at the racetracks gambling. If i wasn't selling papers, I was down at the racetracks. I do not make that much money but it's enough to get me by. Since I do not earn that much money, I usually just wear worn down clothes. I do not live in the lodging house with all the other homeless Newsies. I live with my grandparents in a small apartment. I don't mind living with my grandparents, but they always make me go to school which I hate. Most of the time I will just sneak out of school in the morning to sell the morning papers. Most kids my age do not have to wake up early and sell newspapers. I have it a little easy because I get to live with my grandparents but the other Newsies are orphans and homeless. It's a pretty tough job because if Pulitzer raises the price, we don't sell any papers and that means we don't make any money. Some days we have a good day and sell tons of papers, but other times we have bad days and don't sell any papers.